Whether you’re alone or with your small group, the flights are tailored to your level and objectives. I fly with you solo or in tandem with one of your relation all the time so that i can give you live advices. It's also possible to go for some miniwing or hike and fly sessions. Don't worry, I have lots of ideas, your time with me will become an unforgettable experience. XC guide help you to organise your paragliding cross country trip. Just tell me when you want to come and what kind of accommodation you wish, I’ll sort that out for you. I also organise all the shuttle and retrieve aspect. One of my goal is you to have a stress-free experience. 1 : 1 or small group instruction allows us to be really responsive to weather changes. Less inertia and a perfect knowledge of the area are the keys to offer you what, for sure, will be a memorable experience. Paragliding cross country flying is my passion! Through XCguide, I organise comprehensive paragliding cross country trips and guide you through the sky! My name is Arnaud Baumy, I’ve grown around Annecy where I started to fly in 1994 at the age of 14 years old. Since then, I’ve been paragliding cross country flying for more than 20 years on every continent. I can speak fluent English and Spanish. One of my Mojo is “never stop learning” that’s why I try to fly as much as possible and keep on competing at the highest level. My best result was to finish 3rd at the Serbian Paragliding World Cup Event in 2017 and my best flights, so far, are a flight from La Grave which ended up 100km further top landing the Mont-Blanc and a 260km triangle from my home town Bourg-Saint-Maurice. After having taught in different schools and for different levels, I now focus on organising comprehensive paragliding cross country trips and courses to share my passion for XC flying. My way of working is slightly different as the regular schools which offer collective cross country courses. I mostly offer private trips and coaching ( 1 to 1 or with smal group ). I love working that way as I think it’s much more efficient to transmit my passion and knowledges. There are also much more human exchanges as it’s easier to get to know each other. Whether you’re alone or with a small group of friends, I design for you your dreamed paragliding cross country trip. You choose the date and the area of flight and I organise everything : accommodation, the retrieve aspect and every thing you would need. My courses are totally customisable so your paragliding cross country trip can be mixed with some miniwing or speedflying tuition. It’s also possible to do some hike and fly. Actually everything is possible! Just let me know if you have any idea and I’ll do my best to make it happen. My courses are open to all level pilot : whether you’re a complete cross country beginner to the most advanced pilot. The task and tuition will match with your level and objectives. In order: I want you to fly safe, have fun and improve! I fly with you solo or tandem with you or one of your relation to give you live advices and help you to do the most of the day. 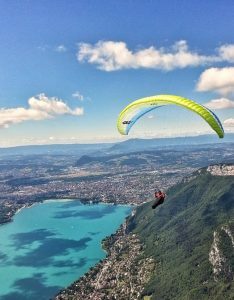 I mostly organise my paragliding cross country courses in the areas I know the best : the North part of the French Alps as Annecy, Chamonix, Saint Hilaire or more South : Saint-Vincent, Saint-André les Alpes, Gourdon. During winter, I also teach speed riding ( also called speedflying) in Les Arcs, a French ski resort in Savoie. Have a look at www.speedriding-school.com to know more.